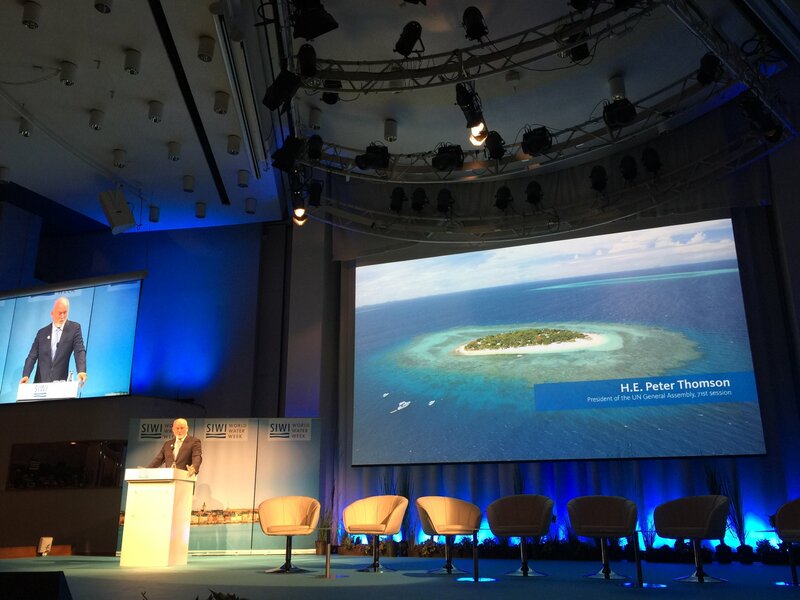 It is a great pleasure to join you today at World Water Week and to be here in Stockholm. This city has being at the forefront of sustainable development since it hosted the first Earth Summit back in 1972, the same year I started my public service as a rural development officer in Fiji! Coming from Fiji, the subject of water has always been an absorbing one for me. For much of my life, the water I drank came from the rainwater caught in tanks from our roof. And back in the seventies, working as a District Officer in rural Fiji, one of my main preoccupations was installing locally-sourced piped water supplies to the villages of my districts. Coupled with that work, was the installation of water-seal latrines in the same villages. I learnt early in life that adequate fresh water and sanitation facilities were vital to healthy lives, education, gender equality, and most other aspects of sustainable development. With all the good work done in the intervening decades, it would have been reasonable to imagine that the challenges of access to clean and safe drinking water and adequate sanitation would by now be behind us. Sadly, that is not the case. Almost 2.4 billion people still have no access to improved sanitation. And a growing number of regions and countries are experiencing rising water stress, exacerbated by rapid population growth, urbanization and of course climate change. As you know, water and sanitation have a central place amongst the 17 Sustainable Development Goals which were universally adopted by the 193 nations of the United Nations in September 2015. Together with the Paris Climate Agreement, implementation of the 17 Sustainable Development Goals represents the best chance our species has to achieve a sustainable way of life on Planet Earth before it is too late. In this context, I believe that SDG 6, the Water and Sanitation Goal, is in need of a major push. The time is right, thus I encourage you all to join together to develop concerted global action to deliver on the targets of SDG 6. Creating a global movement to deliver on the targets of SDG 14 – the Ocean Goal – was exactly what we sought to achieve when The Ocean Conference was held in New York last June. The Governments of Sweden and Fiji came together to obtain a UN mandate for the conference and then worked in a solid partnership to arrange and co-host the conference. Here in Stockholm, I want to again pay tribute to Minister Isabella Lövin for her determination to make the conference the great success it was. From the outset, The Ocean Conference was designed to be the game changer in reversing the cycle of decline in which Ocean’s health had been caught. Without a doubt, the conference succeeded in dramatically raising global consciousness on marine pollution, especially plastic pollution, Ocean acidification, Ocean warming, overfishing, High Seas governance and damage to biodiversity and ecosystems. It was a solutions-focused global event, characterized by inclusivity and common purpose. Thousands of participants attended the conference, including Heads of State and Government, high-level representatives from Governments, the United Nations system, intergovernmental organizations, as well as civil society, the scientific community, the business sector and other relevant stakeholders. From them all came a call for urgent action on behalf of the Ocean as captured in the three main outcomes of the conference. Firstly, UN Member States produced an ambitious political declaration “Our Ocean, Our Future: Call for Action”. Spelling out the priority actions the world must take to save the Ocean, the declaration provided the necessary convergence of political will by world leaders and has given us all the mandate to act. Secondly, seven inclusive partnership dialogues heard the problems of the Ocean from the best of world expertise and innovative solutions were presented as the way forward by those assembled. And thirdly, nearly 1400 voluntary commitments were pledged by a broad range of stakeholders, including governments and civil society, aimed at advancing the implementation of the targets of SDG14. The ultimate value of The Ocean Conference lies in the degree to which we implement the called-for action. To ensure implementation we need a common work plan, a dedicated set of actors and achievable targets. The work plan is currently being formulated, with the United Nations analyzing and modeling the many outcomes of the conference. At the same time, the relevant actors are being organized for the task ahead. The targets already exist in the form of SDG14, with three of the goal’s targets set to mature in 2020. In the meantime, the Governments of Portugal and Kenya have offered to host a second UN Ocean Conference in 2020, thereby giving us three years for our common work plan to be acted upon. When we gather again in 2020, we will have the opportunity to comprehensively assess our successes and failures in the implementation of SDG14, so that we can make the necessary adjustments and march on to fulfillment of SDG14 by its maturation date in 2030. The great human endeavor of implementing the work necessary to achieve the targets of SDG14 is underway. We must never forget that when it comes to the environment, everything is connected. It makes no sense to consider terrestrial environmental issues, fresh water challenges or climate change in isolation as they are all part of the planetary ecosystem, with one affecting the other under the immutable laws of nature. Thus we must always take an inclusive, integrated approach, never falling back into the failing silos of past status quos. Having said that, we are all called upon to put our skills, ideas and energies to where our particular skills lie. We all have something to bring to the work ahead. So if you are a sanitation engineer, it is expected that you will be working to improve humanity’s sanitation challenges; whereas if you are a coral reef scientist, we expect that you will be advancing knowledge in that field. But of course none should imagine that the state of sanitation and coral reefs are anything but directly connected. I commend World Water Week for bringing us together to discuss the challenges of our time and to appreciate our interconnectedness. I look forward to these discussions and for the action that will arise from the week’s outcomes.